Raw talent (function) is a wonderful trait in a performance horse but it is not enough by itself to guarantee a successful career. You need to build a strong foundation to allow that raw talent to manifest. Feel and form build this foundation. Feel – You want to start with the partnership you have with your horse. Does your horse listen to you and look to you for guidance? Does your horse feel safe when in your company? Is your horse light and also soft? A light and soft horse responds promptly to aids with suppleness through his body. A horse that is soft but not light will willingly bend his head to the side or bend through his body but not take that movement down into the feet. This type horse can run off with his head around because he is not light to aids telling him where to put his feet. A horse that is light but not soft will move off of aids very promptly but without relaxation or suppleness. My mare, Cerise, was like this. I spent a lot of time with her to gain her trust so that she wanted to work with me. Cerise was always quick to move off my leg and follow my rein aids but the challenge was getting her to soften through her jaw and ribcage. I spent many hours asking her to lower her head and relax her body. It took patience but the result was well worth the effort once Cerise began to feel back to me when I reached for her. We never got this perfect but over time we built a relationship and I felt Cerise would try to do anything I asked of her to the best of her ability. I could tell that Cerise felt safe and good when she was with me even if she was not 100% happy or comfortable with the situation. My new mare, Martini, is very talented and naturally athletic so her form and function are pretty good. Right now we are getting to know each other and working mostly on feel. She is not sure if she wants to connect with me and that is ok. I keep working to present myself and my requests for her in a fair and clear manner that is fitting to her. She doesn’t have to like me yet but I hope someday I can earn her respect and trust. Feel is not something that can be achieved with any one exercise. It comes from spending time with your horse and listening to him. It takes being present when you are with your horse and addressing his needs. His feeding and management are just as important as his training. Making sure his tack fits and his teeth and feet are balanced is your responsibility. Most of the time, developing feel in your horse is more about paying attention to where you need to improve and change within yourself. Form – Exercises on the ground and under saddle help your horse learn to use his body in the most efficient way. Horses are prey animals so they become unsettled if they don’t feel like they can move quickly to escape danger. Not to mention that we interfere with their natural movement when we ride them. You will gain in respect from your horse when you help him get more handy. Cerise was not a strong horse so I spent time with her to build her muscles. I gave Cerise the Fire horse balancing formula to help her develop her muscles and relax during our training sessions. We did more transitions and backing than we did just moving forward. Backing circles really helped her develop the muscles around her stifles so that joint could be more stable. Many young horses need this kind of work so they don’t injure themselves trying to do work they are not physically ready to do. Muscle Mass is another product that helps horses build muscle in a natural way. Lateral work also helps with suppleness. Some horses are not naturally coordinated so you can work on trotting over polls and working exercises like the TTeam labyrinth. These exercises help them pay attention to where their feet are. Function – It is a wonderful thing to have a horse with raw talent but a horse with feel and form can often beat the talented horse without these foundational basics. To bring out the best in a horse that you have put the time into to get solid you will want to focus on the skill sets required for the desired event. A jumper must learn to balance himself so jumping chutes help build this skill with the least interference from the rider. Cow working horses need an actual cow to work or a mechanical flag to hone their skills in stopping and turning quickly. Barrel horses need to be super skilled at doing small, precise circles at speed with softness and bend through the body. You get the idea. Starting with event specific skills without establishing the foundation of feel and form is dishonoring and frustrating to even the most talented, willing horse. A horse with solid feel, form and function will often do best the more you stay out of his way. There is no need to continue to drill and bore the horse once he is solid. Get out and have fun. The Holistic Horsekeeping website is indeed a wealth of holistic horse care information. If you have questions about issues with your horse, you can search through our extensive article library and blog articles for answers. You’ll also find other useful information such as suggested reading and holistic vets in other areas on our resource page. If you are looking for just more general information on holistic care or specifics on subjects such as hoofcare, temperament typing, vaccinations or nutrition, take a look at our many affordable ebooks, books, audios, DVDs and Kindle books. If you are not able to get the information you need from all these sources then a consult can be done to get individualized help for your horse. Should you decide you want to deepen your understanding of nutrition or homeopathy, Madalyn offers mentoring for select individuals. 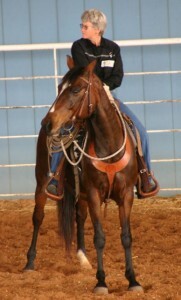 You can find information on the Mentoring Program at http://www.holistichorsekeeping.com/mentoring.html. Temperament typing is another area to gain a deeper understanding of your horse and what he needs from you. You will find lots of information about the temperament types including an online course available and help from trained temperament typists at http://horsetemperament.com. With all these resources available to you 24/7, you will probably find the answer to your horse questions. If you still need more insight, message us on our Holistic Horsekeeping Facebook page or Horse Harmony Facebook page and we will post your question to the Facebook forum to ask others for input. And finally, we offer a free weekly newsletter you can sign up for to keep up with the latest holistic horse care topics, learn more about your own health and see answers to clients that may be similar to your concerns with your horse. You can sign up for the free newsletter at http://blog.horseharmony.com/.